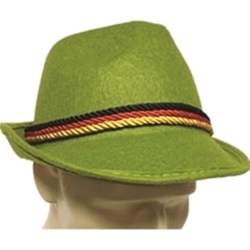 This Alpine Style Hat is a simulated wool hat which includes black, red, and yellow cords around the hat, as a nod to the flag of Germany. This hat is commonly worn with lederhosen to create a vintage German look. Available in green, or gray with feather accent. October fest, or Oktoberfest, is a German tradition of celebration which dates back to the Middle Ages. It is a period of merriment, known for its wide array of food and ale.